Feijoa. Feijoa Tree ( Pineapple Guava). Wholesale Nurseries grow a range of Feijoa Trees that are a small hardy fruit tree growing to 4m. Also known as the ‘Pineapple Guava’ they are are originally from South Africa however have been widely grown in New Zealand for many years. Both drought and cold tolerant Feijoa can be used for fruit (better in cool climates) or as a hedging plant. An interesting plants as the fruit of Feijoa need a cool winter to develop full flavour. Also used as ornamental tress where the glossy green foliage with a felty underside makes them attractive through the year. Attractive flowers, white with pink centers and contrasting red stamens look great in spring. Good bark colour is an added attraction. Feijoa are widely grown in New Zealand and many new cultivars are coming onto the market. 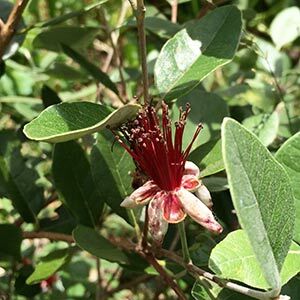 Feijoa are used both as a fruiting tree and an ornamental tree, the fruit can be eaten when ripe, and the pink flowers are attractive.